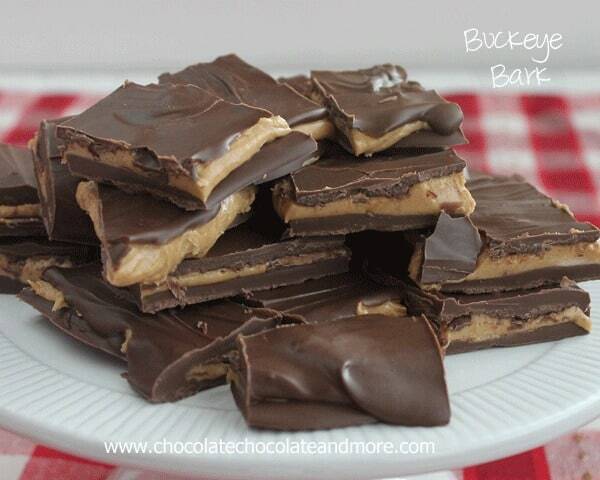 Buckeye Bark - Chocolate Chocolate and More! I mentioned a few days ago on Facebook that I was playing with melted chocolate again. I just can’t help myself sometimes. It’s just too easy to whip up a fabulous treat. My son is the Buckeye maker in our house. It’s his thing. No one else is allowed to make them. But he’s been slack. Things like school, friends, the XBox, have been monopolizing his time. So what’s a mom do do when searching through the cabinets, I spy the peanut butter just sitting at the front of the shelf? Don’t tell my son, but this may just be better than his Buckeyes! Melt chocolate according to package directions. Pour half of melted chocolate onto a parchment lined baking sheet. Using a spatula, spread chocolate to create a large chocolate slab. Place in freezer for 10 minutes to solidify. Mix together peanut butter and vanilla then stir in powdered sugar until smooth and creamy. 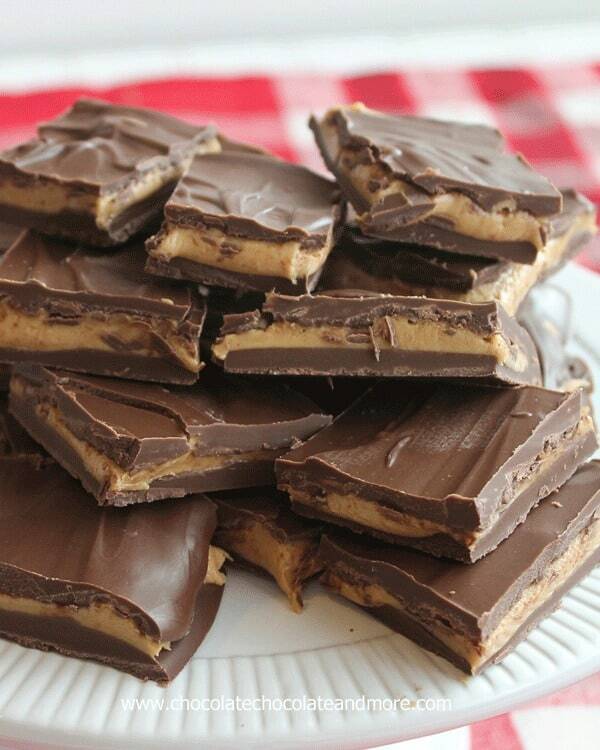 Spread peanut butter mixture over chilled chocolate slab to cover entirely. Pour remaining melted chocolate over top of peanut butter layer. Carefully spread to edges to completely cover peanut butter. Return to freezer for 5-10 minutes to set top layer of chocolate. Cut Bark into desired sized pieces and enjoy. Store in an air tight container. No need to refrigerate unless in a warm climate. Chocolate almond bark comes in a variety of package sizes, usually 16-20 ounces depending on brand. Both will work fine with this recipe. I have a big bowl of buckeye dough sitting in the fridge because I don’t have the time to roll it out! I’m thinking I should just make this bark! Holy cow, it looks delicious Joan! Pinning! These look great and I am not a big fan of peanut butter. Mt oldest son loves it though! Could you use chocolate chips? Is the bark different from the candy melts I dip my cake pops in? Chocolate bark and Candy melts are the same thing, both tempered for candy making so either would work fine. I’d try not to use chocolate chips as those don’t harden back up liike a candy bar and would have to be kept refrigerated. I was wondering the same thing. I do not have any of that kind of chocolate. There is an epic argument with no end going on between me and Michael–he (and most of his family) think Buckeyes are cookies (he also thinks brownies and rice krispie treats are cookies…but I digress) and I’m like THEY’RE CANDY. yeah. anyway. I love em. and this bark is awesome, love that it’s so simple and easy! Yum!! Can’t go wrong with this recipe! This is just pure perfection and heaven to me! I love that creamy peanut butter coming out the side! Looks delish! What size pan do you recommend? Also, I too have chocolate chips. As Kelli asked above, can I use these instead of the bark chocolate? I just use a large cookie sheet, I don’t spread all the way to the edges just to the thickness I want. You can use chocolate chips but they won’t harden up like chocolate bark or candy melts will so you might need to keep your finished bark in the refrigerator to keep it hard. Can I use chocolate chips? Also, what about natural peanut butter? Hi Sheryl, you can use chocolate chips but you’ll probably have to keep the bark refrigerated or the chocolate will get melty. 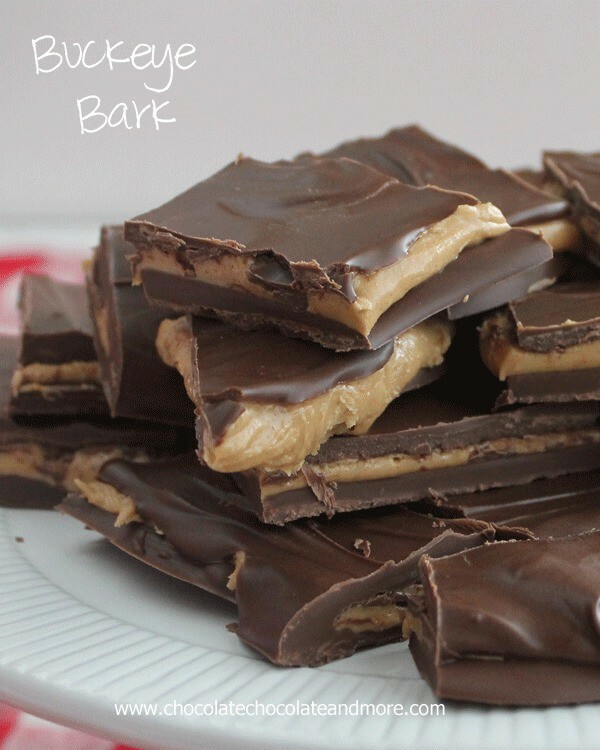 Chocolate bark and Candy melts are tempered to harden back up like a candy bar after melting. As for the natural peanut butter, sure you can. i’d add the powdered sugar about 1/2 a cup then see if you need more since natural peanut butter is usually thicker than brands like Jif and Skippy. Love this! Gonna make it for Christmas! oh, Y.U.M. thanks for the brilliant idea! I can vividly remember my grandmother making buckeyes each year during the holidays. LOVE! I adore your simple bark version. I know at first taste, memories would coming flooding back. Yum! My goodness, this looks good. I drooled a little more with each picture, too. This is fantastic, and so much easier re than all the little balls. Thank you! Going to try this recipe for St Nick’s tonight ( being of German descent we most certainly celebrate it here!) Usually you hang your stocking on the eve of Dec 5th and if you have been VERY good, you get chocolates, an orange or tangerine, an apple, some nuts to crack and perhaps a small gift,,this is for my DH( he will get his favorite CD also) and the kids that live in town here,,,,,,,I was wondering, how would this travel, mailing from a cold state ( WIsconsin) to an even colder state ( Michigan) , our temps have been 30’s and low 20s at night and heaven knows WHAT upper Michigan has been,,,,at times, below zero ( already! which is unusual even for them) Just wondering if I could safely send some in a tin to them in December,,,thanks! Now I am off to the store to get my ingredients and then I will look for a chocolate that tastes like a Mounds bar used to taste ( back when I indulged occasionally, I have been walking many miles per day now so I want to keep weight OFF!) thank you OH so very much! As long as you are in the cold, just like a candy bar, this Bark will ship well. Happy Holidays! I just made your recipe today, and the peanut butter just never sets up. It keeps on oozing out of the chocolate layers, even after refrigeration. Perhaps an additional cup of confectioners sugar might be added to the peanut butter to solidify that layer a little better. If I decide to repeat this recipe I think I will tweak it in that direction. every brand of peanut butter will have a different level of oil so you may need to use more confectioner’s sugar to get the consistency you want. Also how big is your cookie sheet? i had so much trouble trying to cut these. How did you get them cut so nice , when i tried cutting the peanut butter squished out and when i tried breaking it never lined up with the bottom layer so looked terrible 🙁 I like the taste but i want what i make to look good too lol please HELP!! Did you use candy making chocolate such as Candy melts or Almond bark? That might be the first issue. Second, was your peanut butter “runny” when mixed? You might need more powdered sugar to stiffen it up and hold it’s shape. Every brand of peanut butter has a different consistency to start with, some having more oil than others. You can also try refrigerating your bark before cutting to solidify the peanut butter filling for cutting. Hope these tips help. Brilliant!!! I am making candy tonight and was thinking I didn’t have time for real buckeyes…this is perfect!!! Can I ask what size pan, or cookie sheet, you used? Also, this filling works great when rolled into balls and dipped into melted chocolate. It can also be shaped into egg shapes for Easter, etc. I made buckeye bark today first time,taste really good but doesn’t look pretty like yours .when I try to cut it it breaks in pieces not nice squares like yours, what am I doing wrong.? We will still eat it, thanks for all the yummy recipes. Oh my! This would be dangerous to have in my house! It would not last long, but I would weigh 500 lbs. It looks decadently delicious! So glad you are enjoying this, it’s one of my favorite candy recipes! 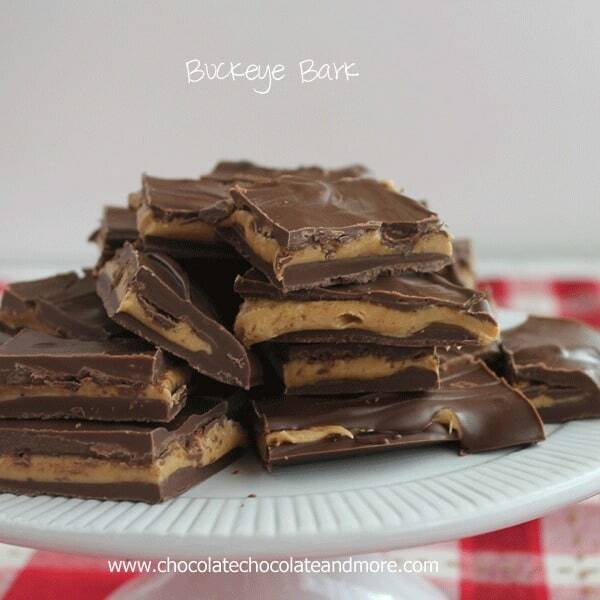 I just found your blog and your recipe for buckeye bark… Looks so yummie! You said your son is the Buckeye master? :O) how does he make them? 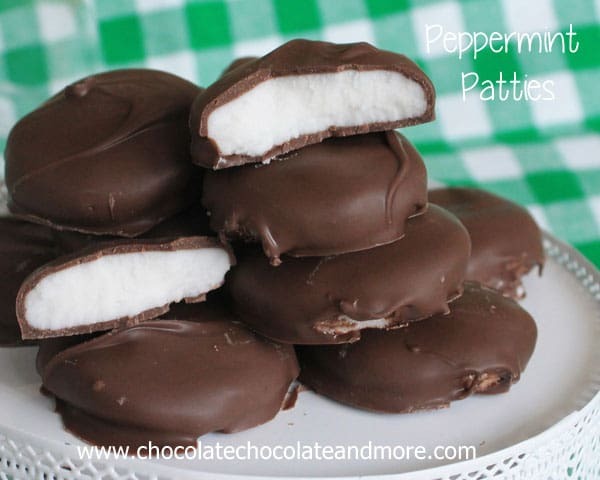 I have never made them yet but always wanted to to try…. Does he have a recipe or technique?